Google’s announcement to shut down Nearby has come as a shock to many who were invested in the beacon technology leaving them confused or scrambling for solutions to ensure that their beacons do not go to waste. While Nearby will continue to work till December 6, 2018, we have already launched our solution, NearBee, that is a better and superior alternative to Google Nearby. And, if you have used Nearby to deliver proximity marketing content to your customers, you must be well aware of all the shortcomings that Nearby Notifications had. Passive notifications, unclear guidelines, excessive spam, duplicate notifications are just a few of the issues with Nearby. In a way, we should be glad that Google Nearby is dead because now proximity marketing can get back to what it was always meant to do: Provide rich and contextual notifications to users who are in control of what type of content they would like to see. And NearBee or your own app powered by NearBee’s SDK is going to be at the heart of it. So, how can you make the switch from Google Nearby to NearBee? If you purchase beacons from Beaconstac, you do not have to configure anything as NearBee is designed to automatically start detecting Beaconstac beacons. For non-Beaconstac customers: Can NearBee replace Nearby? NearBee has been designed to be hardware agnostic. That means even if you have not purchased beacons from Beaconstac, you can still start leveraging NearBee to run your proximity marketing campaigns. Beacons must transmit the Eddystone UID frames. 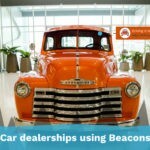 Beacons must transmit the Eddystone URL. The Eddystone URL must be in HTTPS format. If you are still having an issue with getting NearBee to detect your beacons, send us a bug report. If you have already registered your beacons with the Google Proximity Beacon API, all you need to do is clone the Nearby attachment and add it to the Beaconstac namespace. Please read this detailed guide on how to register attachments. Once your attachments are registered, NearBee will automatically start detecting them and start displaying notifications in the background. 67% of SMBs have an app and the number is consistently on the rise. As a small or medium business, an app allows you much greater control over how your customers interact with your business. In fact, make sure to read our blog on 5 reasons why small business should have an app. If you still feel that having an app may be too big of an investment or if you are still unsure of where to start, start encouraging your customers to download NearBee. NearBee is a free app available on both the iOS and Google Play Store and if app adoption is your worry, read our blog on how to encourage users to download NearBee. In fact, a local partnership with other SMBs is also beneficial as customers who have NearBee can start receiving notifications from all the businesses in the area. As a proximity marketing solution providers, if you have been using Google Nearby primarily, pushing an app may seem like an added step but the benefits outweigh the cons. An app allows you to ensure that your marketing campaigns are in fact well received as opposed to passive notifications that often went unread with Google Nearby. It also eradicates the issue of duplicate notifications which can annoy customers if they are in the same area for a long time like a cafe or a restaurant. Insert NearBee SDK into a pre-existing app to convert it into a beacon powered app. Currently, NearBee is able to send rich, non-passive and non-duplicate notifications to users in the background. Future updates of NearBee will include a plethora of robust features including the ones below. With Nearby, there was no option for businesses to be able to give their customers a consistent brand experience. A future update of NearBee will ensure that when a customer walks into say Starbucks, the app icon, app colours and the in-app logo will completely change to reflect Starbucks’s unique branding. This essentially means that businesses that do not have an app or do not want to build one can still use NearBee to give their customers unique and consistent shopping experience. Nearby treated all customers the same. Businesses were not able to target their frequent customers with relevant content which can adversely affect customer loyalty. 82% of US adults are loyal to brands and 62% of them report that having a personal relationship greatly affects their loyalty towards the brand (Source). With NearBee, businesses can foster a relationship with their customers pushing relevant promotions and loyalty awards to their frequent visitors. A major issue that retailers and businesses had with Nearby was that beacon notifications disappeared as soon as a customer was out of the range. With NearBee, we aim to solve this issue by allowing customers to ‘follow’ businesses and receive timely updates. Consumers follow brands and like receiving notifications about new products or promotions. Half a billion Instagram users follow brands. 80% of Twitter users mention a brand in their tweet. By allowing consumers to follow businesses and only sending them controlled updates, a non-spammy and rich user experience can be ensured. If businesses also have an online store on Shopify or Square, their customers will be able to shop online within the store avoiding lengthy checkout lines or order products from the comfort of their home and get free store pick-up or home delivery. Once a customer visits the store, they can be easily retargeted online on Facebook and Google. The CTR of a retargeted ad is 10x higher than that of a display ad. All that is required is the Facebook Pixel ID and the Google Conversion ID. For businesses that want all the benefits of having their own app without investing in one, NearBee is an exceptional way to get started as it serves as ‘an app within an app’. With its ability to morph and serve as a channel for businesses to get their marketing campaigns to the right customers, NearBee is and will be of immense benefit to customers and businesses both. What would you like to see in the upcoming releases of NearBee? Let us know in the comments below. Beaconstac is an end-to-end solution that lets you run proximity marketing campaigns through your own app or NearBee. Talk to a proximity marketing expert today and get started.